The Deluxe Bariatric Commode by Drive Medical is made from a durable, heavy duty, grey powder coated steel tubing that is sturdy and easy to maintain and can accommodate individuals up to 650 lbs. The large, padded backrest provides patient comfort and can be removed, tool-free. The large, durable snap on seat and plastic armrests provide comfort and stability. comes complete with 12 qt. 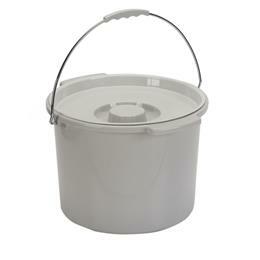 commode bucket and cover that removes from behind. 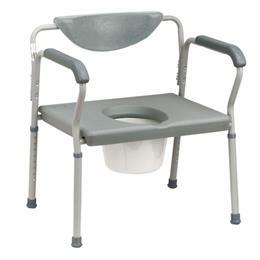 Accommodates individuals up to 650 lbs.